Are you looking for 3D printing services? We provide professional 3D printing services. Can’t wait to talk to one of our consultants? We have a calculator that will provide you with a close estimate for printing your model. Simply upload your model and select the options to suit your requirements. Request an official quote by sending us your STL (Stereolithography) file to thinglab@freedspace.com.au or using the contact form so that we can identify your requirements and check the suitability of the parts for 3D printing. 3D Printing is a process that can produce physical objects direct from 3-dimensional CAD data. The process works by ‘slicing’ the data geometry into many 2-dimensional cross sectional layers, and re-constructing them successively upward within the printer. When the part completed construction, it is removed from the printer and post processed to produce the finished part. +How much does it cost to print a 3D model? We charge for 3D printed models based on a formula that takes into consideration build time, setup and labour time.For data that contains errors there may be an additional charge for the time required to repair the file for printing. We have a calculator that will provide you with a close estimate for printing your model. Simply upload your model and select the options to suit your requirements. Alternatively you can receive an official quotation by sending us a STL (Stereolithography) file to thinglab@freedspace.com.au so that we can identify your requirements and check the suitability of the parts for 3D printing. What is the end use of the prototype? Does it need specific material properties/characteristics? Does the part(s) need support structures for overhanging surfaces? What orientation is required for the part you’re building? +What services do Thinglab provide? 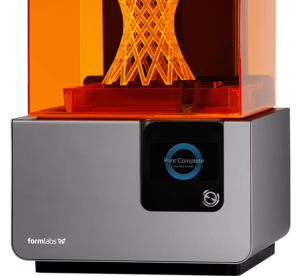 We can provide prototyping services in a range of materials and 3D printing technologies as well as 3D printing consultancy to determine the best technology and materials for your application.If you need a prototype not suited to FFF or SLA let us know and we can help with other 3D print technologies. +How big can I print a part? Depending on the material required we can provide printed prototypes up to a size of 350 x 400 x 320 mm (in FFF) or 140 x 140 x 170 mm (in SLA). *Multiple parts can be bonded together post production, but this is not a service we currently provide. +How long does it take? 3D printing is one of the fastest ways to prototype physical objects, but it is not instant. Build times can take days to print for larger models, plus additional time for pre and post processing. Specifying your deadline is one of the best ways for our 3D printing services team to prioritise your work and ensure delivery for a time suited to you. +What do I need to 3D print a part? All you need is a CAD model of your part and this will need to be saved as a *.stl file, which is the standard file format for 3D printing. Our team of 3D printing services professionals are just an email or a phone call away.